Home » Digestion » What Are the Reasons for Orange Stool? Understanding your stools—also known as poop—can help you understand exactly what is going on within your digestive system. You may be justifiably quite startled to see a different color than the common brown, such as an orange stool. What is the healthiest poop color? A healthy bowel movement is one in which your stool (poop) is well-formed, soft, easily passed, medium brown in color, and has an “S” or “C” shape. Any brown shade will often indicate a healthy stool with no digestive or diet problems. What about other stool colors? Red commonly indicates hemorrhoids; black could be bleeding in the gastrointestinal tract; green often means food is moving through the colon too quickly, possibly from diarrhea; and yellow, greasy, and foul-smelling stools can be due to excess fat in the stool, possibly from a malabsorption problem like celiac disease. However, while some colors suggest a potential health issue, an orange stool is often not cause for concern, and it will resolve on its own. That being said, depending on how long you’ve had an orange stool, it could be an issue. That is why it is important to keep track of how long your poop has been orange to help narrow down the exact cause of the poop color. In this article, we will feature all the potential orange stool causes, how to prevent an orange stool, and when you should see a doctor about your stool color. What are orange stool causes? Certain foods, supplements and medications, medical tests, and diseases may be the culprits behind your orange stool. Poop color can definitely be a symptom of a health problem. Let’s investigate below. Processed and preserved food products are one reason your poop may be orange rather than brown. These products may include artificial food dyes that are red, yellow, or orange. Some of these processed foods include soft drinks, junk foods, fruit juices, candies, and popsicles. The problem here is that the body cannot break down and absorb these artificial colors; therefore, the body flushes them out with other waste material. Regular consumption of processed foods would make your body susceptible to various diseases. You may be thinking, “Beta-carotene is healthy, isn’t it?” It is, but the carotenoid beta-carotene can also make your poop look orange. 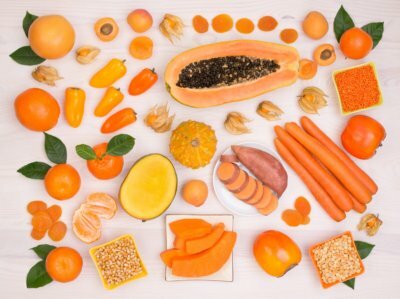 Carotenoids are plant pigments that make certain whole foods look red, yellow, or orange. Beta-carotene is the vitamin A precursor found in plant-based foods such as sweet potato, squash, mangoes, pumpkin, apricots, broccoli, some leafy greens and herbs, and especially carrots. When converted to vitamin A, beta-carotene does everything— it protects eye health, provides immune support, fights inflammation, supports skin health and cell growth, helps prevent cancer, and more. Overall, this orange stool cause is not a threat to your health, and it will correct itself over time. Escolar is a deep-sea, warm-water fish found in tropical waters. When you eat high amounts of this fish, it can lead to an orange stool. Escolar contains an indigestible wax ester fatty acid that causes an oily orange stool and other digestive problems like diarrhea in some people. This fish is not poisonous; however, since the body cannot absorb it, the wax ester becomes waste in the form of an orange stool. If you do eat this fish, it is recommended to grill it until the fat is gone, or eat it in small servings. An orange stool can also sometimes be a symptom of certain digestive problems. Bile is an important aid for the liver and digestion in general, and if your stool isn’t absorbing enough bile, it may look gray or tan-colored. This is particularly visible in a case of acute diarrhea. Also, babies may get blocked bile ducts, and this leads to a grayish or orange stool. Gastroesophageal reflux disease (GERD) is caused by bile reaching the esophagus. As a result, other orange stool symptoms may include heartburn, chest pain, abnormal coughing or wheezing, and a sore throat. A doctor visit is recommended if these symptoms persist. Up to 40% of Americans experience GERD symptoms on a monthly basis. Other underlying digestion problems may also be at the root of your orange stool. For instance, blocked bile ducts can also lead to gallstones. Irritable bowel syndrome (IBS), short bowel syndrome, and inflammatory bowel diseases like Crohn’s disease can also be among the orange stool causes. Liver diseases that may also obstruct or stop the production of bile include hepatitis, jaundice, fibrosis, liver cancer, cirrhosis, cysts, acetaminophen toxicity, alcoholic liver disease, non-alcoholic fatty liver disease (NAFLD), and primary sclerosing cholangitis. To discover if parasites are the cause of your orange stool, consult a doctor or health care professional with the knowledge of parasite treatment. There are certain supplements and medications that lead to an orange stool. Supplements that contain beta-carotene and vitamin A can cause orange poop just like whole foods with beta-carotene. Medications like the antibiotic rifampin also cause light-colored or orange stools. Drugs like antacids with aluminum hydroxide may also produce gray or orange stools in certain people. The cause behind orange poop can also be certain medical examinations, including magnetic resonance imaging (MRI), computerized tomography (CT) scans, or similar tests. That being said, the problem will resolve within a few days after the tests have been completed. Pay attention to your diet. Your orange stool may be due to too many carrots or junk food. Avoid junk and processed foods while eating a high-fiber, plant-based diet with lots of vegetables. Aim to drink eight ounces of filtered water every two hours. Fiber needs water to move through the gut lining, and if there’s not enough, you can experience uncomfortable digestive symptoms like bloating, constipation, abdominal pain, and possibly orange poop. Probiotics improve digestion and help balance the bacteria in the body. Probiotic foods that help with digestion include sauerkraut, kimchi, kefir, and kombucha. It is also a good idea to support your liver health with diet and exercise. A liver cleanse can also help your digestion and avoid orange stools. When should an orange stool lead you to consult your doctor? It is important to pay attention to your other orange stool symptoms to help you become aware of a more serious underlying problem. In most cases, an orange stool doesn’t warrant a visit to the doctor; however, there are some unusual stool colors that do warrant a doctor’s visit. For instance, red stools could mean lower gastrointestinal tract bleeding, black stools indicate upper gastrointestinal tract bleeding, and white stools sometimes mean a liver disease. If you cannot link your stool color to diet choices like carrots or processed food dyes, and you have painful digestive symptoms like abdominal pain, constipation, or diarrhea, it is a good time to visit your doctor. Orange stools after taking the drug rifampin are considered unusual, and if that is the only side effect, then also schedule a doctor’s appointment. Furthermore, tell your doctor if you experience dizziness, weakness, or blood in your urine or stool. An orange stool may lead you to worry. However, an orange stool is likely not a serious issue, and it is often caused by processed foods and artificial food dyes, foods with beta-carotene, and a tropical fish known as the escolar. That being said, orange stools may be a symptom of a more serious digestive problem like GERD, IBS, Crohn’s disease, intestinal parasites, or a liver disease like hepatitis or NAFLD. To prevent an orange stool, eat a healthy diet, drink plenty of water, take probiotics, and support your liver health. If orange stool symptoms persist, consult a doctor. Salazar, C., “Soft Orange Poop Diagnosis: Five Causes Why You Have It,” Knoji Consumer Knowledge; https://gastrointestinal-conditions.knoji.com/soft-orange-poop-diagnosis-five-causes-why-you-have-it/, last accessed Nov. 9, 2017. Balch, J., et al., Prescription for Natural Cures: A Self-Care Guide for Treating Health Problems with Natural Remedies Including Diet, Nutrition, Supplements, and Other Holistic Methods (Hoboken: John Wiley & Sons, Inc., 2004), 504-508. Lunardo, E., “What causes orange poop?” Bel Marra Health, June 27, 2016; https://www.belmarrahealth.com/what-causes-orange-poop/. “Orange Poop – What does it mean,” Act for Libraries; http://www.actforlibraries.org/orange-poop/, last accessed Nov. 9, 2017.